Sarah Palin, in a recent guest appearance on Fox News segments and through her Twitter account, asked Barack and Michelle Obama to “refudiate” implications that the Tea Party movement was racist. She also decided ‘misunderestimate’ and ‘wee-wee’d’ are valid English expressions and got angry when she was called out on her questionable use of non-words. Coincidentally, does anyone else find it as funny as I do that the ‘we should only speak English’ Tea Party crowd typically can barely speak English themselves? 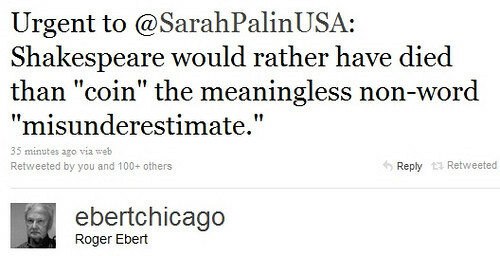 Sarah Palin, case in point. See Also: Sarah Palin Invents New Word: ‘Refudiate’, Palin’s Bigoted Twitter Calls on Muslims to ‘Refudiate’, Palin tweets that she is this generation’s William Shakespeare, Zoh. My. God., Sarah Palin ‘Refudiates’ Criticism, Declares Self Shakespeare Of Twitter, Just When You Thought It Was Safe For The English Language…, and Sarah Palinism of the day: ‘refudiate’. I’m quite sure you mean “case IN point,” not “case AND point”, yes?